"When the world fell, men cowered in fear, and huddled together to hide from the storm. But there were those that embraced it. The storm had shown them the true path, and freed them to return to the old ways. They referred to themselves as The Nation of None, although to everyone else, they were known simply as the Scut." Nomadic and tribal, the Scut wandered the wastes, scavenging to survive. They had adapted to the new world, owned no more than they could carry, and were said to have found ways to pull food and water from even the harshest conditions. They worshiped strange gods that they claimed existed long before the times of man, that they had rediscovered since man's fall. Marrow is the last of the Rusted Bones Tribe. Stillborn, all in her tribe claimed it a miracle when she took her first breath. Those who died and returned were known as the Deathblessed, and were believed to have been sent back by the gods, touched with their blessings. She excelled in everything she did; she was always unnaturally fast, strong, and clever, with an unusual connection to the land, even by the standards of her people. Her strange red eyes were said to see things that others could not. They believed that she was touched by Abarath, a dark and inscrutable god, and was known among the tribe as his favorite daughter. Marrow was 13 when her tribe was massacred by the army of the citadels. Left for dead, she was now twice deathblessed. The years that followed, she drifted through the wastes alone, at times hovering at the outskirts of the camps of travelers, but never seen. She had no connections, her only friend Dodge, her stuffed rabbit that she had kept since her childhood. She swears that he is quite wise, whispering secrets to her, and always watches her back. Even at her young age, she was a survivor and had learned well the ways of her people. Children of the Scut were all raised to be fierce warriors, but from the moment she held her first blade, there was no doubt that this was where her greatest talents would lie. So for years, she honed her skills, tracking, hunting, and killing the armies of the citadels. As she grew, so did her notoriety. 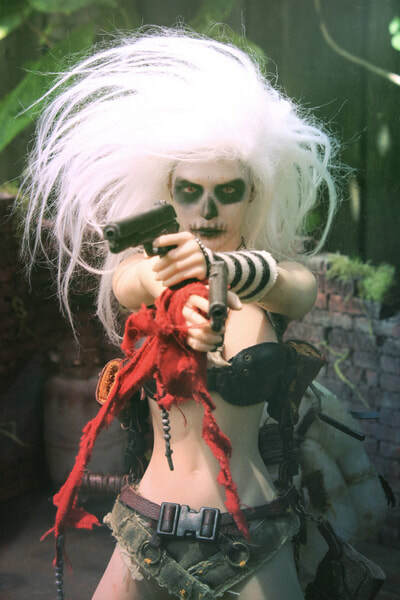 Among the soldiers she had become an urban legend, an unstoppable, unkillable ghost among the ruins. When she would find people, often travelers or small encampments, she would watch and listen, so close but always unseen and unknown. And it was there that she began to hear stories of the man the wastelands call Saint Crow. Rumors that were becoming legends. And she found herself fascinated. He wasn't hard to find, following the trail of chaos he seemed to leave in his wake. For weeks she watched him. There seemed an almost casual and comfortable air about him, no matter the situation, as if he simply doesn't know fear, a hint of a smile always at the corners of his mouth. She had seen him battle the citadels' armies, and while he claimed to not care about others problems, he always seemed to end up helping someone in need. She'd seen him take stupid risks in his obsession with old music, and the more she had watched him, the more he left her confused and curious. He had begun to notice her long before she had decided to make herself known to him. It was subtle, but he had gotten a sense of her, lurking just outside of the periphery of his vision. He was cautious, but over a few weeks, her presence became oddly comforting, like a shadow that followed him, and kept him company without ever speaking. Then he started to catch glimpses of her, like she had wanted to be seen. One night, she simply joined him at his campfire, picking up a piece of his dinner, and started talking to him, without introduction, as if they had always been friends. Since then, she has stayed close to him. She disappears and reappears at her whims, but Crowther is fairly sure she's almost always nearby. When she talks about her past, there's a complete lack of sentimentality, as if everything she's lost is simply a matter of fact. Although he's sure that there are moments he's caught a glimpse of a buried sadness that even Marrow is mostly unaware of. But for the most part, Crowther is amazed at her strange and oddly cheerful disposition. She'll fluctuate from being completely unreserved and talkative - an outpouring of whatever thoughts cross her mind, oblivious to how awkward or inappropriate they may be, as if saved up from her years alone and overflowing - to long stretches of silence, sometimes accompanied by unsettling eye contact that at first made even Crowther a bit uneasy, although he's gotten rather used to it. And as far as he can tell, she seems utterly fearless. Every fight, every situation, she seems to glide through effortlessly. When asked, she told him "Twice now, I've returned from the dead lands, each time with Abarath's gifts. He's given me strength and speed, breathed into my lungs a fire to survive, to live. Abarath doesn't have much interest in the lives of man, but I am his favorite daughter, and I burn so that even he will delight in what I have done. I'd never do anything so pitiful as to ask for Abarath's help, after he's given me so much," and, with a wink, she leaned close and whispered "but I know he watches over me. And pity whoever provokes his wrath." When she had said it, Crowther assumed the words mad. But the more he's seen of Marrow, the more he's started to wonder if they might be true.